I know those handy-dandy spice fajita seasoning packets seem like a great deal, but don’t bother. First of all, they’re full of far more sodium than you’d ever actually want to eat. Secondly, for a one time purchase of a little chili powder and cumin you can make fajitas over and over again. I like to switch up the protein—chicken, skirt steak and even tempeh are all great choices. 2 tsp chili powder $1.50 for 1 oz. Preheat the oven to 300 degrees F. Wrap the tortillas tightly in foil and place in the warm oven. Heat the oil in a large cast iron skillet (or other heavy skillet) over high heat. Add the onions and cook for 1 minute. Add the peppers, broccoli, and mushrooms and garlic and cook for another 2 minutes until the onions begin soften. While the vegetables cook, combine the cumin, chili powder, salt and pepper in a small bowl and whisk together with 1/4 cup water. Set aside. Add the shrimp to the fajita pan and pour the spice mixture over the entire contents of the pan. Cook just until the shrimp turn pink. Pull the tortillas out of the oven, take them out of the foil and wrap in a clean dish towel or napkin. 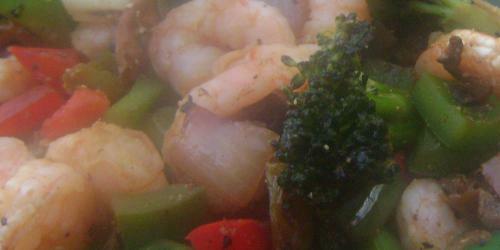 Serve the fajitas in the pan so they stay warm and wrap the vegetable-shrimp mixture in hot tortillas at the table. Also delicious with guacamole or sour cream. I made these for my husband…he absolutely loved them, as did I! They were light, yet filling. The spice mixture is a must and was tasty. We also added guacamole on top of the fajita as “suggested”, and that definetly topped it off! You gave some detail about the important things and these things are a beautiful piece of the ornament. I like the most thing in this article is the picture of the locket which is looking so nice and rare. Overall, all this is amazing. When I completed reading this short write-up I was still in trouble whether this short article legitimizes the title of this post. There are a couple of questions enhanced when I read this review each of the Christians will definitely be sanctified via water which is the demand to that is the crucial points that magazine of bibles is furthermore asserting in it.